Across the board, there is a universal lack of confidence in the security of everyday communications channels—particularly when it comes to the use of online tools. Across six different methods of mediated communication, there is not one mode through which a majority of the American public feels “very secure” sharing private information with another trusted person or organization. While the use of landline phones has generally been declining and the number of cell-only households has been increasing, Americans express the greatest sense of security using landline phones when sharing private information with another trusted entity. More than any other device or communications tool, landline phones inspire the most confidence for these kinds of exchanges. However, the level of confidence is still quite low. Just 16% of adults say they feel “very secure” sharing private information via the landline phone, while 51% say they feel “somewhat secure.” About one in five (19%) say they feel “not very secure,” while 12% say they feel “not at all secure” calling on a landline phone. Women and men express the same low level of confidence in the security of landline phones. Those in the highest income group—adults living in households earning $75,000 or more per year—are more likely to report that they feel “very secure” using a landline phone when compared with those living in households earning less than $30,000 annually (20% vs. 11%). Yet, there are no significant differences by age—people across all generations are equally likely to report low levels of confidence in using their landline when they want to share private information with another trusted person or organization. 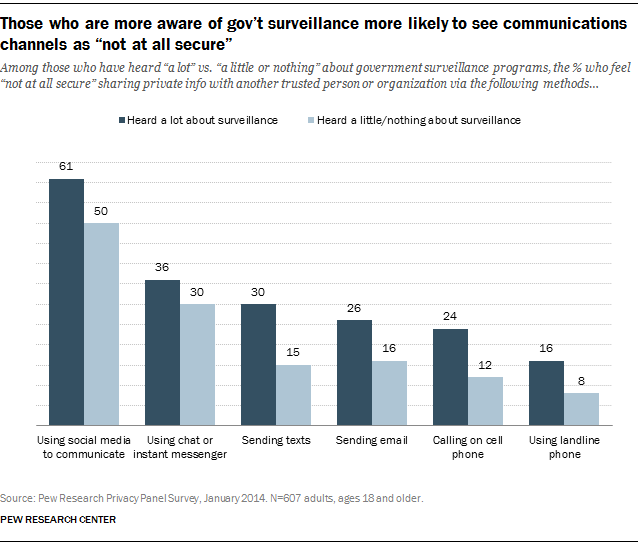 Those who have heard a lot about government surveillance programs are twice as likely as those who have heard a little or nothing to say that landlines are “not at all secure” (16% vs. 8%). Those with lower levels of education are among the least confident in the security of cell phone communications. Among those who have not attended college, 21% consider calling on their cell phone to be “not at all secure,” compared with 12% of those with college degrees. Cell phone users across all age groups and both genders report similar levels of confidence in the security of calls placed on their mobile phones. Among adults who have heard a lot about government surveillance programs, 24% feel as though cell phones are “not at all secure” when there’s a need to share private information with another trusted person or organization. Half as many (12%) who have heard just a little or nothing about government surveillance programs feel this strongly. Women and men express the same lack of confidence in the security of text messages to share private information. Adults ages 50 and older are significantly more likely than young adults 18-29 to rate text messages as “not at all secure.” One in four (26%) adults over age 50 say this compared with 13% of those ages 18-29. While there are some minor variations in responses across socioeconomic groups, they are not consistent enough to suggest a clear pattern. However, those who have heard a lot about government surveillance are twice as likely as those who have heard only a little or nothing at all to say that they feel “not at all secure” sending private information via text messages (30% vs. 15%). The public’s confidence in the security of email is on par with the way they feel about texting; only 5% of adults say they feel “very secure” sending private information via email, while 35% say they feel “somewhat secure.” Another 36% feel that email is “not very secure” when they have private information to share, and 21% say they feel “not at all secure” when using email. Men and women report similar views of email, and adults of all ages generally express the same levels of confidence in the security of email. While there are no notable variations by education levels, adults living in the lowest income households are among the most wary of email security. A full 30% of those living in households earning less than $30,000 annually say that email is “not at all secure,” while 18% of those in households earning $75,000 or more per year reported the same. Among adults who have heard a lot about government surveillance programs, 26% feel as though email is “not at all secure” when they want to share private information with another trusted person or organization, while 16% who have heard a little or nothing about government surveillance programs feel this way. Few Americans view chat or instant messenger as a secure means to share private information; only 4% feel “very secure” using chat and IM, and 25% feel these channels are “somewhat secure.” Another 36% feel “not very secure” and 32% say they feel “not at all secure” using chat or instant messenger to share private information. The most notable variations across various demographic groups for this question are by age; internet users over the age of 50 (38%) are more likely to see chat and IM as “not at all secure” when compared with young adults ages 18-29 (28%). Unlike other communications channels, the proportion of Americans who view chat and instant messenger as insecure places to share private information does not vary according to their level of awareness of government surveillance programs. Men and women are equally wary of using social media sites to share private information, but those over the age of 30 are more likely than young adults to feel as though the sites are “not at all secure.” Over half of adults ages 30 and older (57%) report this lack of confidence, compared with 37% of those ages 18-29. In terms of education-related differences, college grads are generally less confident in the use of social media for sharing private information; 64% of adults who have a college degree feel “not at all secure” sharing sensitive information over social media channels, compared with 47% of those who have not attended college. Those who have heard a lot about government surveillance are more likely to view social media sites as “not at all secure” when compared with those who have lower levels of awareness (61% vs. 50%).